I hear the whistle from my tea. I dream of warmth and spring. after a warm spring rain. Where did you capture that baby, Linda? We’re covered with snow here and flowers are still much hope away. Your picture and words are a lovely ray of spring, though. Much needed. thanks! thank you Maryse. I was going through old pictures and doing some housework! Not too exciting. 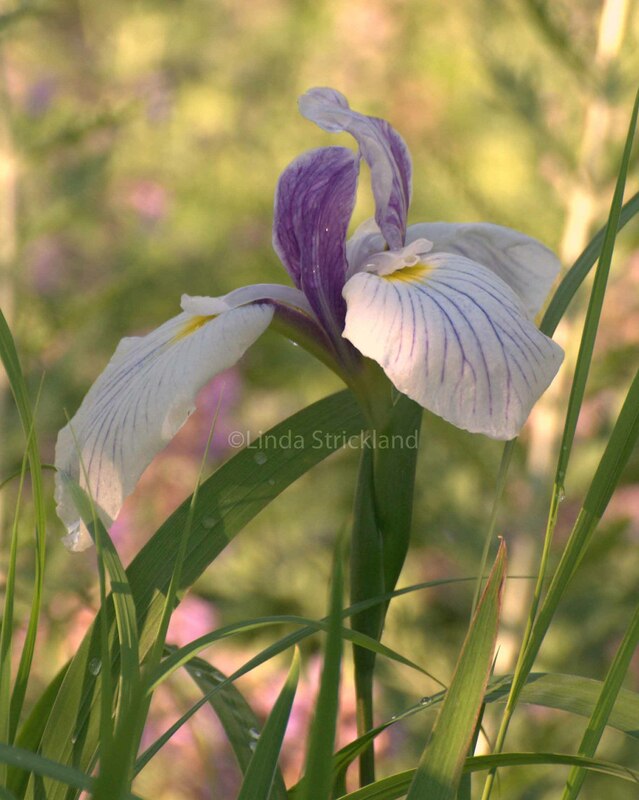 Came across this picture of an iris after the rain. I think I will go to the grocery store and see if I can find some! I love the way that you wrote this. It’s like allowing Love into every crevasse of our lives, and trusting that it will melt through the glaciers in our hearts. Just beautiful. Thank you John! And I love your beautiful thoughts. Takes my poem to a whole other level. I am dreaming of the warmth too and all the beauty that makes it so different from winter. Yes, this winter has been particularily hard. Although I was inspired when I looked at your winter scenes and the lovely music that accompanied it. That took a lot of work to put together, and it made winter look so glamorous! I will look at it again if I get stuck. Thank you Wendy. Spring will be here before you know it. OMGosh! Your photography is gorgeous! I am indeed honored that you are following my blog, Petals Unfolding. May it be a continual source of inspiration to you as it is to me. With people like yourself in my WordPress family, this makes me work all that harder to give you the best I have. I am at the crossroads with my photography. Come Spring, I plan on putting all I know together and keep learning. I have only just begun with what I now know, even after years of working with a camera. The possibilities are infinite. Thank you so much for the lovely comment Amy. I am still learning too. And there are wonderful photographers here in blogland that post so much information, I have found lots of help here. But what I really enjoy is painting a picture with words and an image the way you are doing. And flowers are my favorite! So I know I will enjoy your blog. Honey, IF I could I would jump at following your blog. You are just so good. Between my life and trying to keep up with the blogs I now follow plus allow time for my photography and learning curve……(deep breath LOL)…. Linda, believe me, it is a loss to me. Your work is stunning. And I really love what you are doing, matching words just like me. Like minds! OK. So I won’t loose you, I will follow but I won’t get posts. I really cannot keep up now. But a day may come I might be able to wander over to you. Seriously. I just don’t want to loose contact. And yes, so many blogs where I have learned. I wish this was the only part of my life. I wish…… With Love and HUGS, Amy who is glad I changed my mind midstream and did not delete what I wrote to show you I did. Hehehehehe Ya gotta laugh! Thanks Robin. I think it was some what cathartic! There were days this past winter when my car was out of commission because of the extreme cold, and I was stuck at home. I really was blue!